A style typified by a rectangular two- or three-story house with wide eaves supported by large brackets; tall, thin first-floor windows; and a low pitched roof topped with a cupola. There are pronounced moldings, details and rusticated quoins. Earmarks of the style are arched windows with decorative “eyebrows” and recessed entryways. The style appeared in cast-iron facades, whose mass-produced sections featured many stylized Classical ornaments. 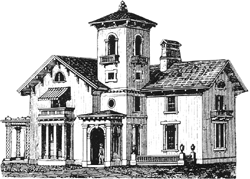 An eclectic style of Italian-influenced residential and commercial architecture; fashionable in England and America from the 1840s to around 1890. Italianate style residential buildings may be classified as: Villas: Domestic architecture intended to resemble prosperous farmhouses or country manor houses of northern Italy; usually two stories high, with an attic story; Town houses: Urban row houses, commonly three or four stories in height with a flat or very low-pitched roof; mullions divide both the upper and lower window sashes vertically into two panes. Commercial Italianate style buildings: a raised pediment above the roofline at the center of the façade, often with the name of the building and/or the date of its completion, and a cast-iron façade. Palazzi: See Italian Renaissance Revival. The house was built in an Italianate style, complete with a tower, which is very unusual in Cardiff. The original faade was of Italianate Style containing large windows with exterior sills and brick frontage. And there's the house itself, built in Italianate style because Prince Albert decided that the view reminded him of Naples. Ward remodelled the Georgian house to be a grander, more elaborate building, with ornate decorations, and added a vast glass conservatory roof and recast its "austere exterior" in the ornate Italianate style used at Osborne House, Isle of Wight, for Queen Victoria and Prince Albert. Designed in a loosely Italianate style, it has an early 19th century core with the principal sections of the hall dating from the late Victorian era. Built in 1912 in an Italianate style in keeping with much of Sursock Street -- where one of Beirut's wealthiest families ensconced themselves in a series of palatial mansions -- the museum's exterior, set behind a grand double staircase leading to the first floor and studded with ornate balconies, looks like a wedding cake of sorts. Fountains, urns and statuary demonstrate the Italianate style and in autumn it comes into its own when the sunlight hits the leaves of 14 different species of acer along with the russets and gold hues in the woodland regions. This 1852 mansion in the Italianate style stands on land with an illustrious history of ownership in Worcester history. BUILT in 1859 as a gentleman's residence, the Falcondale Hotel is fashioned in the Italianate style. Lowlands is a grade II-listed mansion house, built in the Italianate style by Thomas Haigh, a builder and architect, in 1846 on land leased from Lord Salisbury. Comprising four stories, 1201 South Main Street will be designed in a contemporary Italianate style and offer an array of floor plans, including studio, one-bedroom, one-bedroom and loft, two-bedroom and two-bedroom and loft configurations with an average size of 919 square feet. There is a Kroger supermarket--at over 100,000 square feet, the state's largest--but it's been constructed in the Italianate style.